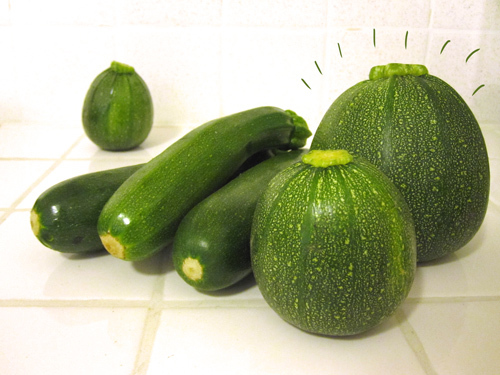 I'd never seen round zucchini before. They look kinda cute. Chunky pasta sauce ingredients. Recipe below! Choose your favourite pasta shape (penne or bowties are perfect, I used whole wheat) and cook whole package according to directions. Meanwhile, in a medium saucepan, saute one roughly chopped medium onion in olive oil. When they start to brown add in 2 large or 3 small zucchini, chopped. (Some mushrooms would be a nice extra.) Fry for several minutes until zucchini start to soften. Add a couple of finely minced garlic cloves and stir in. Two 14oz cans of diced tomato plus one or two finely chopped fresh tomatoes get added next. (OPTIONAL: a couple of tablespoons of tomato paste.) 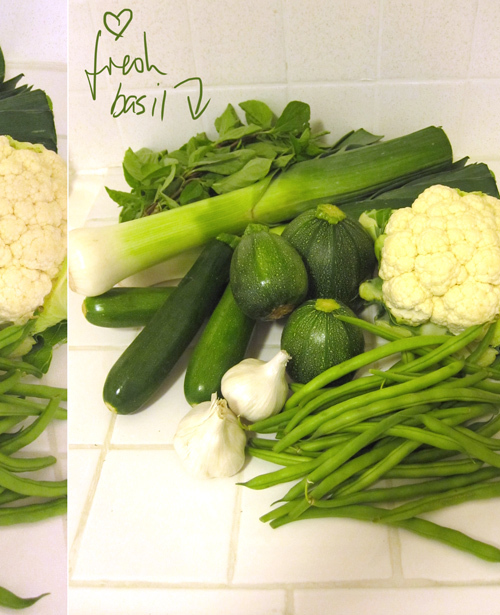 Bring mixture to the boil and then reduce heat and simmer until zucchini is soft and cooked. Season with salt and pepper (and more garlic if you like! 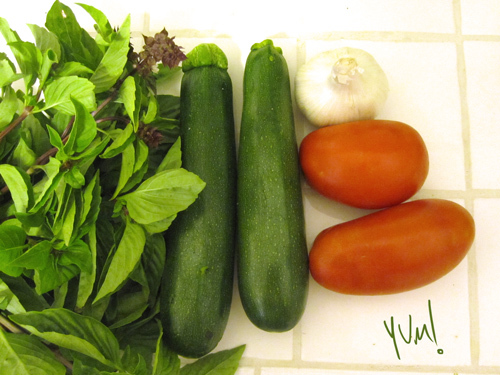 ), remove from heat and mix in a handful of fresh basil (chiffonade). Serve a generous amount over pasta. I then put in chopped up, grilled hot dogs (the flavour worked perfectly!). Or you could add cheese (which I plan to do with the meatless leftovers). Easy to make advance. Makes around 4-5 generous servings.